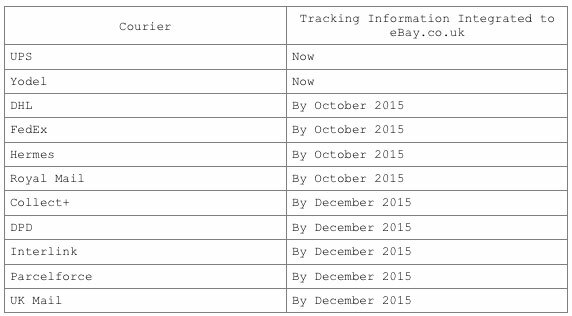 As most of you will already be aware, eBay have recently released their Autumn 2015 Seller News update. And for once, there are some pretty big changes announced. The reason for this is simple – eBay and PayPal split up in to two separate companies earlier this year, which means eBay can no longer hide behind the performance and results of PayPal. To me, this is the main reason why we’re seeing some fairly substantial changes being announced, as eBay really do have to take action now. And overall, this is a good thing! A lot of the changes are in areas that people constantly ask for (and things that I receive a lot of emails about). Probably the most important changes are to do with eBay’s Defect Rate, the current seller performance measurement, which you can read more about here: eBay’s New Seller Standard – The Defect Rate. Changes to seller performance measurements – in eBay’s own words, “this means relying more on objective data instead of subjective buyer inputs” (sounds good!). Delivery and returns improvements – eBay are merging the current returns request procedure and their managed returns process in to one simple, single returns process. Expansion of product identifiers – exactly as I predicted earlier this year, eBay are rolling out product identifier requirements to further categories. 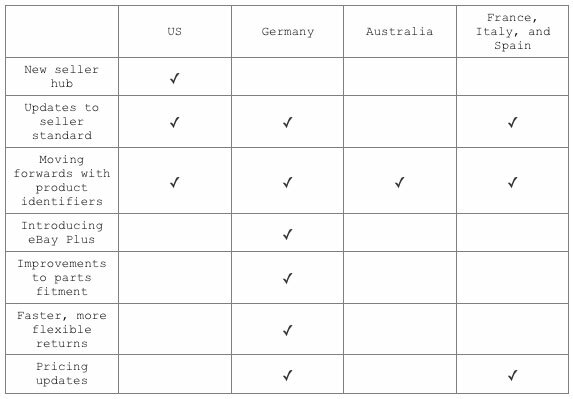 Changes on international sites – there are also some additional changes being made on eBay US, Germany, Australia, France, Italy, and Spain. Of course if you don’t sell internationally these changes won’t affect you in any way. So on the whole some fairly important and impactful changes. Let’s now go through them one by one, in more detail, so you can see exactly what is being altered and how that will affect you and your business. 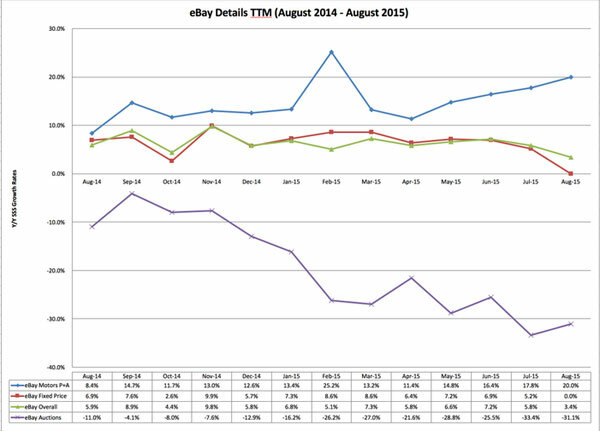 eBay have basically completely re-worked the way they measure seller performance; buyer’s feedback and opinion now mean very little and eBay will instead rely on objective data – namely the updated defect criteria as well as the newly introduced on-time delivery metric. One thing to bear in mind though – these changes only come in to effect on February 20th 2016. Although disappointing, this is probably a good thing as we don’t want teething problems and all the other usual issues with implementing changes to affect us in the most important months of the year, September – December. Now I know what you must now be thinking – “amazing”, right? I mean, this is pretty much exactly what people have been begging eBay for… you are no longer at the mercy of your buyer (being blackmailed in fear of negative feedback) and a sale will no longer be counted as defective even if you do everything right (provide returns, re-send missing items etc.). BUT, it’s not all sunshine and roses, as eBay have of course adjusted the maximum allowed defect rate to take in to account the more lenient requirements. This means that while although the defect criteria has been made a lot easier on sellers, eBay are also expecting a lot less defects as a result. The changes for non-top-rated sellers aren’t actually that bad, as you can still have 40% as many defects as before, but for top-rated sellers it’s a little harder as the maximum allowed defect rate has been cut to one fourth of what it was previously. And that’s not all – there is also the new on-time delivery metric! We all know just how important delivery time is for online buyers, and the standards in this area are becoming increasingly high, with Amazon recently introducing 2-hour delivery in certain areas! So it comes as no surprise that eBay have created their new seller performance measurements with delivery time as a big consideration. But once again eBay have actually tried to be extremely fair in how they are going to measure “on-time” delivery, supposedly basing it on what you control – dispatch time. Of course both of these points rely on you using a tracked delivery method, which won’t always be the case, and that’s where point no.3 comes into play. Simply put, if you post using a non-tracked method, then as long as the item is delivered in your stated time frame then you’re fine as well. My initial reaction to the on-time delivery metric was that eBay are being fairly reasonable, as if you’re posting 10% of your items late, then you’re doing something wrong – no two ways about it. BUT after digging a little deeper and thinking about it more, there are actually a few worrying aspects about the whole idea. Firstly, while in theory the tracking integration with My eBay (more on that later) is a good thing, I certainly don’t want to be relying on it for my Top-rated seller status! What happens when there’s a glitch and the tracking information is uploaded incorrectly or not at all? How often do you post something recorded, then check the tracking information on the day of delivery and it still says “being sorted at the national hub”? It goes without saying that there will be issues with the tracking information being recorded correctly, and to me it’s very unclear what’s supposed to happen then… am I expected to contact eBay and manually show them proof? One, I simply don’t have time to waste on that and two, will they even take the evidence in to consideration? Past experience suggests they won’t. And the second big problem I have with the new delivery metric is for items that are sent without tracking. As we went over just now, if I post an item via Royal Mail 1st or 2nd Class, but not recorded, then as long as it’s delivered on time I’m fine and no defect will be recorded. Well, not quite! Royal Mail themselves set a minimum service standard of 93% for First Class post, which means 7% won’t arrive in one day (and that’s IF Royal Mail meet their standards!). That is nearly DOUBLE the maximum allowed rate to maintain Top-rated seller status. To me, this is a big problem that eBay need to address. The whole on-time delivery metric idea is good in principle but once again the execution and specific details are lacking. We’ll have to see how this plays out but at the moment the best thing I can think of is to offer two day dispatch time, and then always post within one day. Of course that’s not ideal as one day dispatch time is a good selling point for prospective buyers but losing Top-rated seller status would be a lot worse, so in this case the old business maxim of under promise and over deliver might be your best option. Last but not least, there is one final change in eBay’s seller performance measurements, and that is in regards to the offered return period. From May 2016, you will need to offer 30-day returns in order to be a top-rated seller. All in all I am happy with these changes, as I think they do a good job of removing the “buyer element” of defects, and you’re now wholly responsible as the seller. We just have to wait and see how On-time delivery works and how precise it will be. The main idea behind eBay’s changes to the returns process is fairly simple – they are trying to unify all sellers to a single system. At the moment there is the usual return request process as well as the managed returns process and this is causing some confusion, which is why eBay have combined them to one single system – which already take effect from 16th September 2015. Having read over the information in detail, it seems to me that the main change is introducing basic customisation and automation features to all sellers (previously this was only available to sellers using managed returns). To take a look at the customisation options, head to My eBay > My Account > Site Preferences > Return Preferences. 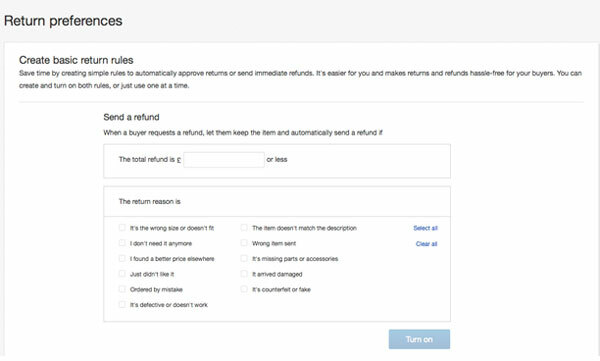 Automatically sending a refund for items of a certain price and for certain return reasons – for example if you know that it’s not worth your time to process a return for a £3 item, you can just automatically refund your buyer. Or if the return reason selected means that you have to pay the return postage, and you know that’s not worthwhile for you. Approve returns automatically for items under a certain price or for certain return reasons. This basically works in the same way as for issuing refunds, except that rather than sending your buyer their money back, eBay will instead send a return label that they can use to send the item to you, at which point you will need to manually refund them. I would really recommend that you sort this out now, as these changes are already LIVE!!! Also, when you’re setting your automation options for providing refunds or approving returns, keep in mind that the return reasons for buyers are also changing. eBay claim that these new return reasons are more specific and will therefore save sellers from being penalised unfairly or having to pay return postage when really the buyer should cover it. However I personally don’t see how this will help; scammers/abusers know how to game the system on eBay and know what options to select so that you, as the seller, are liable for the return postage cost. These new options just aren’t going to help in that regard. The second part of point no.2 is to do with delivery, and specifically, integrating tracking information to My eBay. 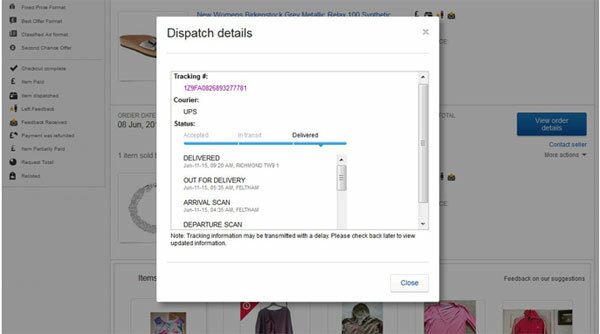 From September 2015 onwards, when you add tracking information to My eBay, it will then display details of the delivery for you and your buyer – including courier information and the status (accepted, in transit, delivered) of the order. This status check is how eBay plan to monitor the on-time delivery metric that we looked at earlier, so it’s very important that you do upload tracking information when possible. And that’s it! There’s nothing further you need to do, other than adding tracking information for your courier once they’re integrated with eBay. To be honest this is a bit of a non-announcement, at least in terms of the Autumn 2015 update. Why do I say this? Well because eBay really haven’t announced anything new or anything concrete. They simply state that they’re “moving forward with product identifiers… expanding the list of categories for which product identifiers are a requirement”. eBay then go on to say that they’ll let us know more details soon, but will give at least 90 days’ notice so that we have time to comply. And that means that the extended category requirements won’t come in to effect until early 2016, so nothing to concern yourself with for now. Although, as I mentioned before, these changes won’t affect you at all if you only sell on eBay.co.uk, I still want to very quickly run through them, as I know a lot of you do list on the international eBay sites directly (as you should!). Seller Hub provides a centralised view of your account, including listings, order activity, and detailed sales data. Mainly for sellers who list directly on eBay or use Selling Manager Pro, Seller Hub will be live at the end of September. The same changes we’ve already discussed in detail; eBay plan to launch the new seller standards across all sites simultaneously on February 20th 2016. The compulsory categories for product identifiers differ slightly, country by country, so make sure you always check the specific requirements for the site you’re listing on after the Autumn 2015 update. This is actually quite an interesting development, as eBay Plus is something I’ve been keeping a close eye on since first reading about it in the Wall Street Journal earlier this year. It’s basically eBay’s answer to Amazon Prime (a little late, as always!) but as well as providing free, fast shipping and returns to buyers, eBay are also offering some benefits to sellers who opt in. This includes a 15% discount on final value fees, better placement in search results, free return labels, and the ability to purchase discounted eBay branded packaging materials. I’ve always said that it’s good to monitor programs that eBay test/roll out on international sites as they’ll often come to the UK later, and this is a perfect example as eBay Plus could be a very important development! If you don’t sell parts in the vehicles category on eBay, then just ignore this. If you do, then it basically means that buyers can now search by part on their mobile devices, as well as desktop. These changes mirror what’s happening on the UK site, which we’ve already gone over earlier in this post. Last but not least, eBay are also introducing some changes to the pricing structure of some listing features on eBay France, Italy, and Spain. So if you sell on any of those sites, head over to the announcement page on eBay itself to get exact details of the changes. And that brings us to the end of today’s lengthy post! Overall my feelings towards this announcement are mixed. On the one hand I don’t like the fact that some recent changes are being reversed or reworked, as this uncertainty isn’t good for business. It’s hard to plan ahead if eBay are going to be making changes so often, but then again that is their speciality! But on the other hand, some of these changes do seem very positive for sellers, even if they are well overdue. There’s one thing that’s certain – with the uncertainty surrounding eBay after their split with PayPal, it is imperative that you diversify and sell on multiple platforms! I have talked about this numerous times in the past, but I’m going to keep mentioning it anyway. At least until I can go a week without hearing from someone whose business is in trouble because they relied solely on a single platform. And on that note – see you on Wednesday when I’ll post an often requested guide on importing children’s clothing & other products to the UK from China. Hi, The DSR system never worked before and I doubt nothing will change, and why? There are many sellers who try to sabotage other sellers accounts by getting friends/family or by their other account to buy from the other seller and then leave negative feedback or just giving low DSR knowing the seller will get defects. DSR’s or saying the item was late, which is what they will do now. Unfortunately it is what it is. I totally agree with you that this is unfair system but if you want to sell on eBay, you will have to adapt. And best way to do it is to send items tracked. if your current products are too cheap to send tracked, you need to look to increase prices or simply sell something more valuable. As harsh as it sounds, this is business at the end of the day and only fittest will survive. is it also fair that Ebay state that Royal Mail 1st class post is a next day service? when it is not. Royal Mail state that although they aim to deliver next day, this is not guaranteed and that the only next day service they have is Special delivery. So how is it lawful for Ebay to take it upon themselves to state that 1st class post IS a next day service? so I loss a days grace in posting time scales. Also are you aware that their system gives the same delivery date for someone buying at 9am as they do for someone buying at 10pm that night? again a lost day as dispatch for the 10pm item will be the next day. All in all my conclusion to this farce is simple, its all so that they can remove top seller state and therefore no seller discounts ! As for 9AM/10PM orders – well, remember that you state your dispatch time – 24 hours so actually you can dispatch both orders next day if you want and it would still qualify. Obviously, 10 AM order dispatched on same day, within few hours, will be delivered quicker. Okay so in priciple I love the new system for seller standards. However I am showing ‘carrier says late delivery’ on 4 items and after checking, ALL of these were attempted delivery on time, but the customer was out so was carded. The next day the item is collected from the delivery office by the customer, but eBay shows as late delivery. Should have mentioned, this was RM Signed For 1st Class that was used. Yes, this doesn’t seem fair at all. We should all contact eBay and inform about such “flaws” in the system and hopefully they make some changes before the 20th February to reflect this. These new delivery metrics worry me a lot as do eBay’s estimated delivery times. I sell on ebay Spain and ship goods from Spain using the spanish post office Correos. 80 to 90% of my deliveries are by normal post. Ebay gives estimated delivery time for this service at around 2 to 3 days yet the average for Correos is 3 to 5 days and the success rate for Correos to deliver on time is far lower then it is in the UK. Quite often i receive mail sent to me by normal post from within Spain 7 days after the post mark. To compound this eBay do not take into account times when the seller is absent and has temporarily closed the store or when there are public holidays as the estimated delivery dates shown to buyers is still 2 to 3 days during those times. If eBay want to compete with Amazon and guarantee quick delivery they need to set up their own delivery service which can guarantee the time scales that they are giving to buyers. Yes, we’ll have some few rough months ahead of us now, to see in real life how the new system works in real life. With eBay, it’s always the case of messing it all up when new rules come out and then they try to fix it on the go, as more and more sellers are picking up flaws in the system. Does this mean seller feedback is going to be scrapped? Miffed my perfect 100% feedback was reduced to 96% because of two buyers trying it on in the last 6 months. EBay customer service although sympathetic refused to remove it because they claimed it was the buyers right to express their purchase experience. These days I have very few sales because most buyers prefer 98% or above. Ebay customer service could only advise I get more sales in to dilute the impact of the two negs. yes, negative feedbacks WON’T count towards your defect rate anymore. In your case, as eBay says, you should sell of some cheap £0.99 items as auctions to get new feedbacks in which will improve your overall rating. Regarding your comments on despatch times and Top-rated seller status. Correct me if I am wrong but I thought that to retain Top-rated seller status orders now have to be despatched on the same day or within one working day. So to offer a two day dispatch time, and then always post within one day would surely mean losing my Top-rated seller status due to the new Top-rated seller status requirements or am I missing something. No, you’re mixing up TRS with eBay Premium Service. TRS does not require you to dispatch within 1 working day. eBay Premium Service does. For top seller status your item has to be received within 3 working days. I satisfy this with the dispatch time of 24 hours and 48 hour tracked delivery. I am thinking the following to give me some leeway…. Could I change this to 48 hour dispatch time and next day delivery? I will then continue to send items next day to full fill the delivery estimate. BUT if for any reason I can’t send the item within 24 hours but the item is still sent within 48 hours, a late delivery is not recorded, as it is sent within dispatch time. Basically does ebay know I have used a 48 hour courier and not next day in this circumstance? Well, they will know that you didn’t dispatch package within 24 by the time you upload tracking info. If you don’t dispatch within 24 hours, your listings won’t qualify for Premium Service status. How can anyone promise to POST a package within 24 hours ? LIFE HAPPENS. Migraines, medical appointments, dead car batteries…….why not say ship “within three days” ???? OR WHATEVER YOU WANT ? And if buyers don’t like it then FINE. IT’S YOUR BUSINESS AND YOUR LIFE. It’s what buyers expect nowadays, don’t blame eBay for that. Everyone is spoiled with quick, free delivery and that’s what eBay wants to offer to their customers too. And there’s a safety net in place too – like for normal (not TRS) sellers you can have late delivery rate as high as 9% with minimum of 8 cases. So even if you don’t dispatch one or two packages on time (due to reasons you list) it’s not like you’ll be punished for it or banned from eBay selling. Have you seen the preview of these new metrics in your account? If you go to your seller dashboard a pop up is displayed giving you some data on how it will be when they come into effect. I have to say, as I post 99% of my items with RM 2nd class, the late delivery does worry me a little. Right now I’m finding that with same day despatch and RM 2nd class, customers expectations when seeing the Fast and Free with delivery timescale is really high, in the past few weeks I’ve definitely seen an increase in customers believing that to be a cast iron deadline rather than an estimate. Couple that with a (seemingly) drop in RM service on 2nd class, I’m not sure I would keep my Top Seller status over time. I haven’t seen how a customer provides this delivered on time metric yet (perhaps I should look at my personal purchases and have a play) but if they are simply asked “Did it arrive on time?” Yes/No with the high expectation already in place, I can see a lot of “No”s adding up. At least Amazon are more realistic with their delivery estimates. Defect rate really shouldn’t be a problem, as expected but details on how exactly on time deliver will work are yet un-known. If you post on time and upload a validated tracking number, or your buyers tell us their items were posted on time when they leave Feedback, you’re all set. Otherwise, if the tracking details or your buyers indicate that more than 9.00% of your transactions were dispatched late, we may follow up with you about the handling time you offer in your listings. When there’s no tracking information available and no response from the buyer, the transaction won’t be counted. So will have to wait and see how that works in real life or until eBay gives more detailed info on this. Great stuff your post are very educative and resourceful! Just wondering if you have any knowledge on importing solid minerals to UK. zinc,lead,copper iron ore,zircon,zircon sand. I am projecting expanding into the UK and am sourcing for client. I have not been lucky yet. Also, what do I do, what duty do I pay. But on another issue. This is a little dumb, but…. I am importing some items to sale on eBay. How do I work out the price to sale them?after adding all my expenses. purchase price, freight, etc. You should really calculate the selling price BEFORE you buy any products for resale. You do this by looking at prices on first page results and trying to find the price point at which YOU feel you can be competitive. Are most of the information and changes that are stated in your guide apply to U.S. sellers as well? Would this then mean that I would get a defect, as there is no way the delivery would arrive on time but at the same time I have absolutely no control over the weather and the snow gates getting closed on the A9. I have TRS and 100% positive feedback with 1 defect over 12 months, I will be feeling very disappointed if I am to be penalised over something I have no control over. We don’t know yet the technical details, force major situations, weather, strikes – how they all will affect eBay’s judgment on this new, on-time delivery metric. We just have to wait for it to be introduced fully and see how it all works. I have just red your post. Thanks. I am wondering are you going to update EAB with those news? 1. What will happen if my defect rate will be more than 2% on February 20th when the rules are changing? As my defect rate is 3% at the moment. Is it possible to get in trouble or they are going to refresh all accounts on that date? 3. How about those return changes – will I be able to provide my sellers with prepaid label as I was doing before? Or buyer will be able to get that label and send the item back without me involved? As that would be a big problem as address to which they will need to return the items is always changing. We don’t know all the details yet so we just have to wait for February to see how this transformation goes on. 1. eBay says that we’ll see in advance how the new performance standard looks. This means that they will probably run both systems at same time for few months and then switch over. 2. It is fine is certain situations, like explained in the article. 3. Check it out on eBay right now, these changes have already been implemented! I am not selling at the moment but I am about to create loads of listings so it would be great to hear your advice as it would really help me to build a strategy. 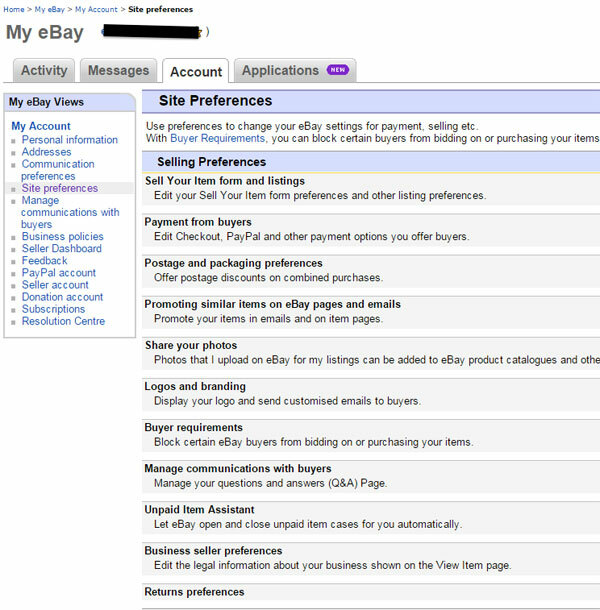 Buyers will be given your returns address, which you specific in your eBay account settings. It can’t be different for each listing…. Yes I understand but returns will go to my different suppliers straight away.